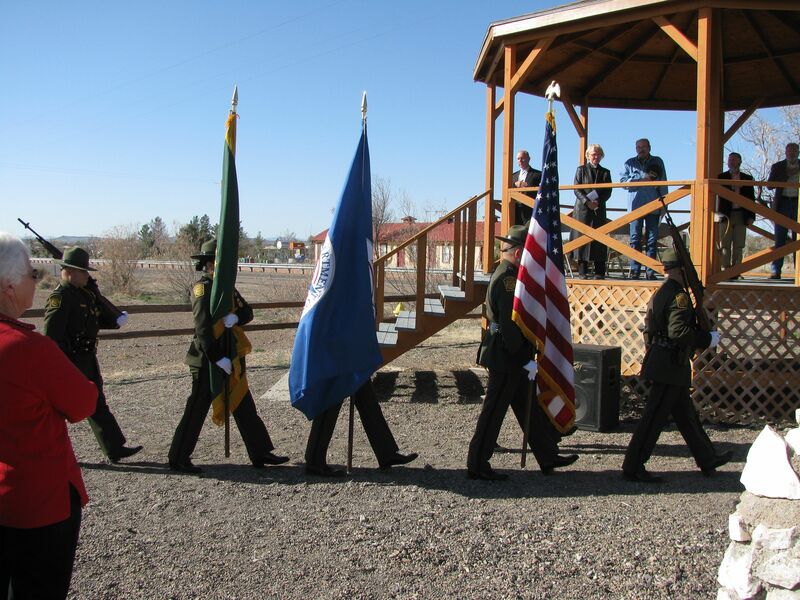 The U.S. Border Patrol’s Honor Guard presented the colors at this morning’s 99th anniversary memorial to the infamous raid on Columbus by Mexican General Francisco “Pancho” Villa on March 9, 1916 – On Columbus Historical Society’s Kiosk podium are, L to R: City Councilman, Bruce D’Salas; Rev. Susan Hutchins; Chuck Hargrave, Columbus American Legion Commander; Sam Sadler of Deming and Paul Nimick of Columbus. A number of local and some more distant New Mexicans and Texans gathered at the grounds of the Columbus Historical Society in downtown Columbus this morning to commemorate the devastating raid on the town that took place in the early morning hours of this same day 99 years ago, a raid by Mexican revolutionary General Pancho Villa that served to put the tiny town on the map of U. S. History. By the time the surprise attack had been successfully fought off by the local garrison of US Army troops from the 13th Cavalry, 18 Americans had been murdered and over 80 Mexican raiders had been slaughtered in the ensuing mayhem. 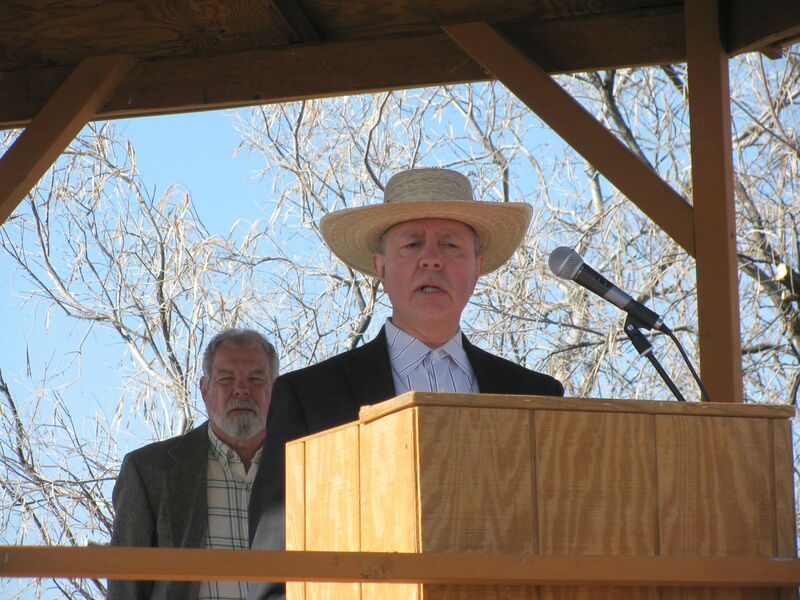 Under a beautiful Spring sky, the ceremonies were led by Master of Ceremonies, Paul Nimick, of Columbus (seen above) and commemorated by Village Trustee Bruce D’Salas (pictured immediately below). 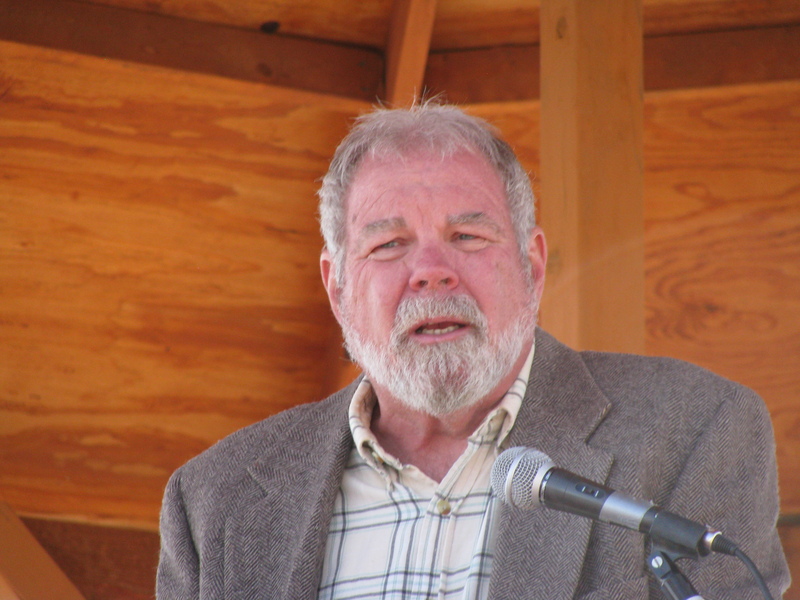 Richard Dean, a local resident and President of the Columbus Historical Society (CHS), the annual event’s sponsor, addressed the audience with insightful memories previously recorded by a few of the bloody battle’s surviving widows. Mr. Dean’s own great-grandmother had been widowed by the raid, when her husband was assassinated by the Villistas. 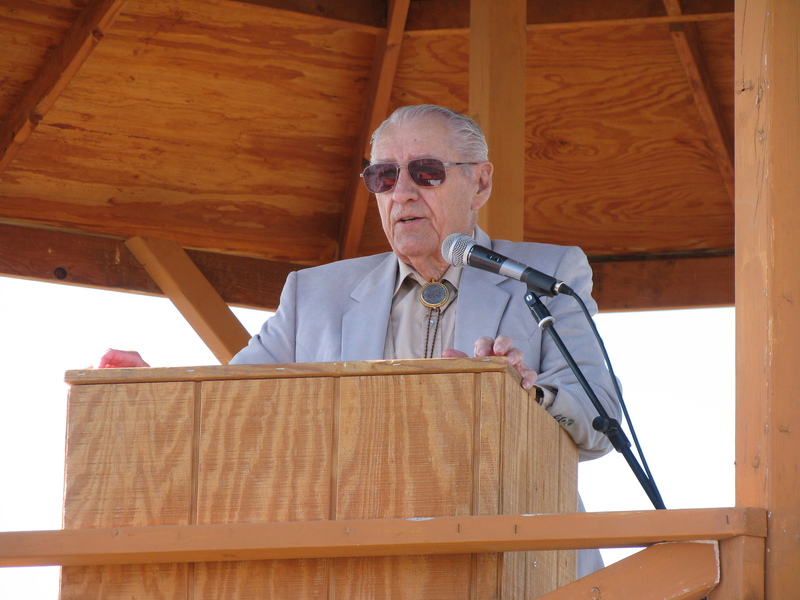 Mr. Dean, longtime scion of the tragic events of that fateful day, has guided the CHS for a number of years, and he and his wife, Betty Dean, almost single-handedly resurrected the old Columbus Cemetery from the dust and sage overgrowth of the local desert. It is now one of the town’s pristine sites to visit. Mr. Dean went on to enthusiastically explain the CHS’s plans for next year’s once-in-a-lifetime Centennial Raid Day Event, observing that on the raid’s 75th anniversary, there had been a huge crowd of over 25,000 people in Columbus for that occasion, and he had been an honored guest and spokesman for the historical raid on NBC National Television. Mr. Dean speculated that the Centennial event might easily draw many more visitors than had descended on the small town on the Mexican border 24 years ago, for that special anniversary. The raid on Columbus led to another imprint on U.S. History by the town: It was the first deployment by the American Military of mechanized vehicles; and the first for airplanes, thus bringing the notable title to Columbus as “The Cradle of American Air Power” – which is, of course, the incident that directly lead to the creation of our own FASF. Part of the Ceremony was the poignant roll call of both the military victims of the raid and of the civilians. 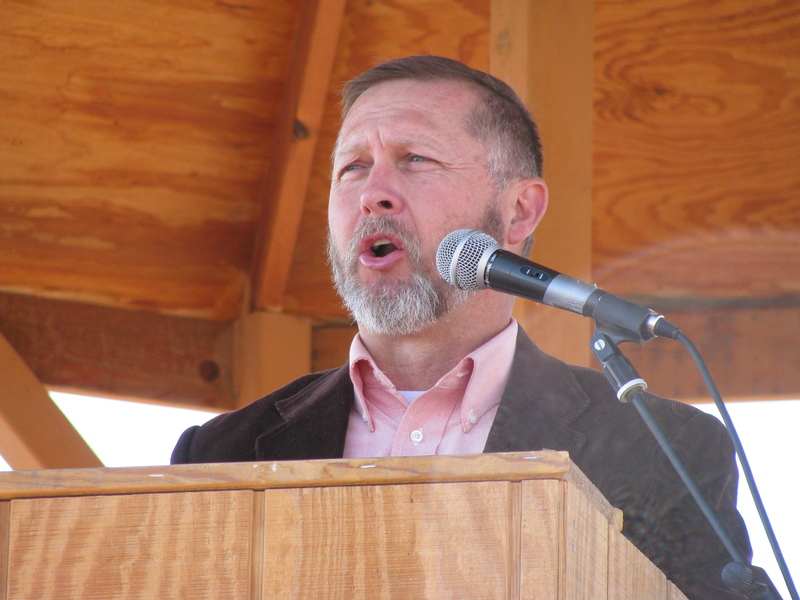 Leading the call from the podium was Sam Sadler of Deming (pictured in the second photos below), and Chuck Forgrave of Columbus, Commander of the Columbus American Legion Post. 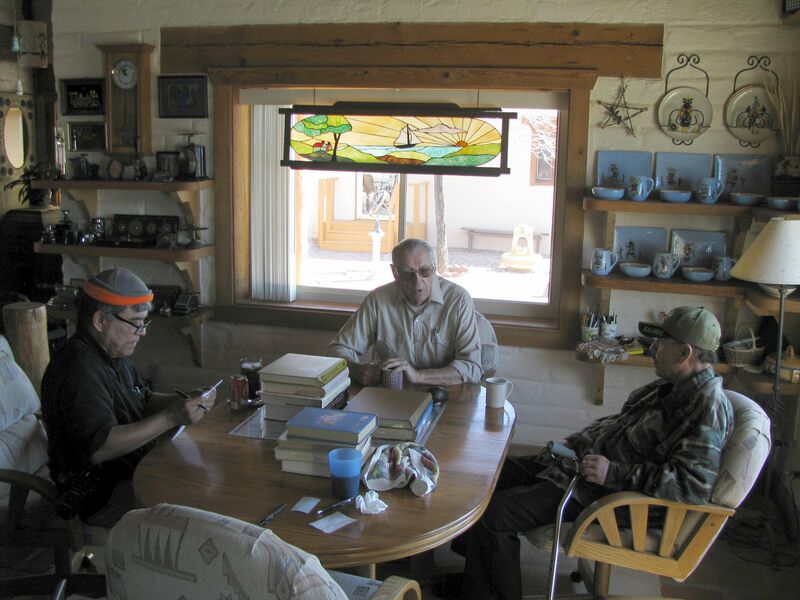 After the memorial service was completed, several of the key guests from El Paso met with the Dean’s at their Columbus home to discuss and plan for the Centennial event and for a new Website for the CHS. The U.S. Border Patrol Color Guard presented the colors for the morning’s service and the Invocation was given by Reverend Susan Hutchins, of Columbus. After the ceremonies concluded, some of the attendees and special guests gathered to talk shop, including these four Columbus history and FASF buffs: Above are pictured, L to R: FASF VP Roy Mantei, FASF Advisor, Dr. Robert Bouilly; Major George Armendariz , Retired US Army Special Forces and Special Ops Intel officer, and Rene Rodela, both from El Paso and well-known mentors for young El Paso High School Students who excel in American History. The El Pasoans are helping design a modern cutting edge Website for the CHS. 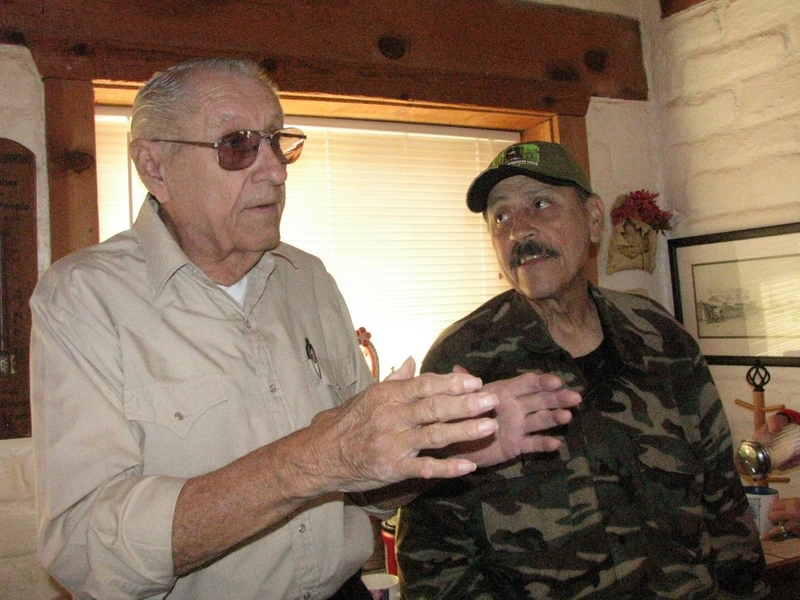 After the ceremonies at the CHS facilities in Columbus, Mr. Dean (L) and his wife, Betty, retired to his home, where they hosted some of their honored guests and discussed plans for next year’s big Centennial event with Major Armendariz (center) and Mr. Rodela (right), both of whom are helping the CHS President plan the new CHS website. Mr. Rodela is a website designer by profession and manages his firm in El Paso. 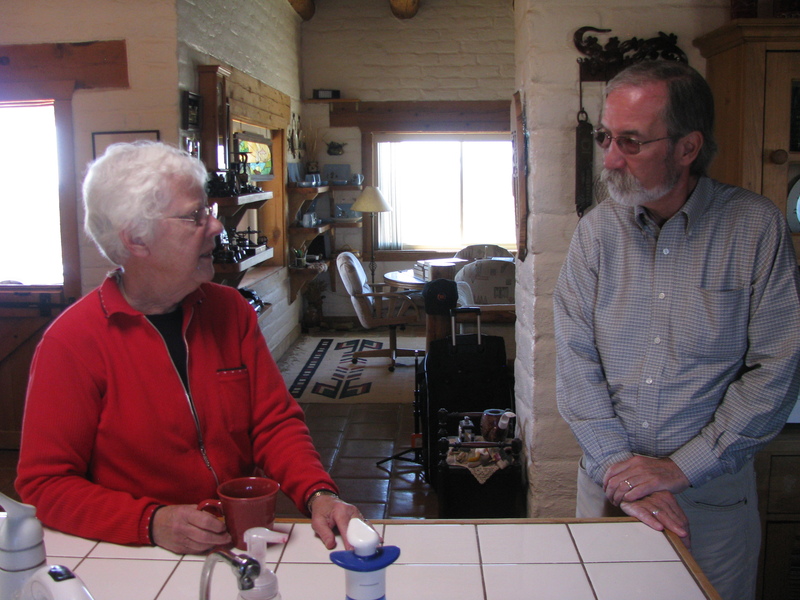 Betty Dean (L) chats with FASF VP, Roy Mantei in the Dean Kitchen. The FASF hopes to assist its sister local non-profit, the CHS, get ready for the coming year’s big event and hopes to coordinate their respective activities for the Centennial celebration. Mantei and his companion FASF VP, Dr. Kathleen Martin, are official Liaison Officers to the CHS and are both active members of that organization as well as the FASF. This entry was posted in HOT NEWS! on March 9, 2015 by FASFRIC.